In December 2002 I witnessed a wonderful performance by The Damned at The Gloucester Guildhall that rekindled my liking for this band. Subequently these pages have been collated around my interest in the band. 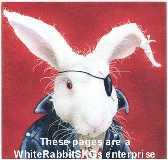 All feedback greatly gratefully received... email whiterabbitskgs@gmail.com. For more information about happenings with the Damned nowadays see Official Damned.com. Page content last reviewed/updated on: 11 April 2018.